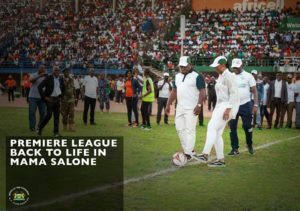 A total of 32 teams will battle in the inaugural edition of the President Julius Maada Bio Trophy, which is expected to kick-start at the end of February, 2019. According to the tournament’s chief organiser, David Momoh, the competition will be played simultaneously in Bo and Kenema, and that they have already named the crown as the ‘President Trophy’. Momoh further disclosed d that the registration process was still on and opened to teams from the Western Area, as well as from the Northern region. “We decided to stage this tournament which will be a yearly event to maximize the contribution of sports to inclusive quality education, economic empowerment and national cohesion in Sierra Leone,” Momoh said and thanked the Chief Minister, Prof. David Francis, and Sports Minister, Ibrahim Nyelenkeh, for their support as the brains behind the tournament.